When a £100 DVD recorder pops onto the test bench, I tend to expect a mixed bag in terms of performance and features. With Lite-On's latest budget model, an unadorned front fascia doesn't give much away, from its row of six rectangular controls to the spidery, green characters on the display. Connectivity is promising, though, with a pair of Scarts joined by audio outputs in both electrical digital and analogue stereo forms. While no HDMI output is par for the course here, finding a DV input for digital camcorder dubbing behind a frontpanel flap is a pleasant surprise. The TV output Scart is RGB, but the aux input is not - a shame. The tuner is analogue. Editing features are predictably nonexistent, and comparable with those found in analogue-era recorders. Disc contents can be erased or recorded over, and you can find your way about more easily by naming your discs and adding chapter marks, either manually or automatically at intervals. Recordings are made on either DVD /-R or DVD /-RW discs, and offer up to six hours of recording time from the longest of the five modes. Unlike its similarly-specced stablemate, the 5115GDL, it can't record onto dual layered R discs. Unsurprisingly, the feature list is relatively limited. Using Zoom you can magnify the picture up to 4x while slow motion slows things down to a quarter of the regular speed. Its other features include a free-rate recording mode, named Just Fit, that automatically sets the highest possible recording quality for the room available on the disc. There's also slideshow, parental lock, and one-touch recording functions, plus an Easy Guider onscreen system that is admirably straightforward in its logic and workings. 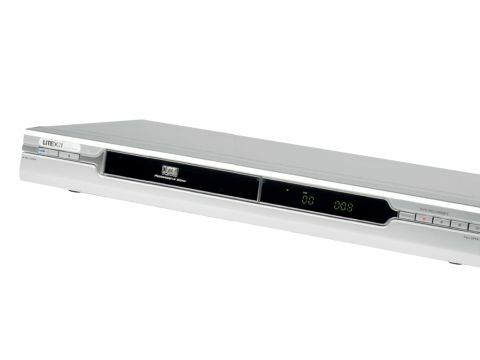 The problem with some budget DVD recorders is that in cutting corners to keep the price tag down, the manufacturers sometimes lose features that most people would consider essential. So the absence of a digital tuner and RGB inputs mean that we already know its performance will be limited before we have even powered up. That said, recordings of regular TV programmes look reasonably good - scoring highly on picture sharpness and offering respectable levels of detail. But when I moved down the recording levels the quality dropped significantly each time. Rock bottom was reached with the six hour mode, which records in the ancient MPEG1 format and it looks like it too. This effectively puts it at the level of an LP recording on your old VCR, i.e. more suitable for the odd episode of EastEnders than your favourite fine art programme. It certainly made me reminisce to see the picture stability disappear as the subjects unintentionally trampolined about the screen, but not in a happy, nostalgic way. Similarly, digibox recordings are somewhat lacklustre, and retained good pictures only by using the top modes. Another weakness is the 5155GHC's inability to record logos and text with any proficiency. Contrast is poor and definition somewhat blurred. It was something of a surprise then to find that DVD playback lacked the various limitations mentioned thus far and offered bright, detailed pictures with decent levels of contrast via the RGB Scart output. The absence of a reasonable clutch of editing features and the lack of a digital tuner and RGB input form a double whammy which makes the LVW 5115GHC less the value-for-money star than first thought. When you factor in some of those recording caveats, too, then the decision to keep your hands in your pocket is even easier to make. Of course, if you think that £100 is going to bring all the glories of state-of-the-art digital recording flooding in Technicolor into your front room, then you're bound to be disappointed.